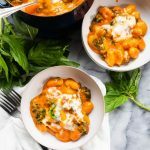 This red pepper and tomato baked gnocchi has five ingredients, including kale and basil, and takes minimal effort. You’ll have a creamy, melty, delicious pot of gnocchi ready for dinner in no time! In a medium, oven-safe saucepan over medium heat: bring the soup to a simmer. Add the gnocchi and basil and cook, stirring, for 8-10 minutes (or until fully cooked). It will take longer than the 2-3 minutes on the instructions, since we’re not cooking it in water. A few minutes before the gnocchi is done, stir in the kale. When the gnocchi is done, sprinkle the cheese over the top in an even layer. Broil on the top rack for a few minutes, until the cheese is melted and browning (it took my oven 2 minutes).